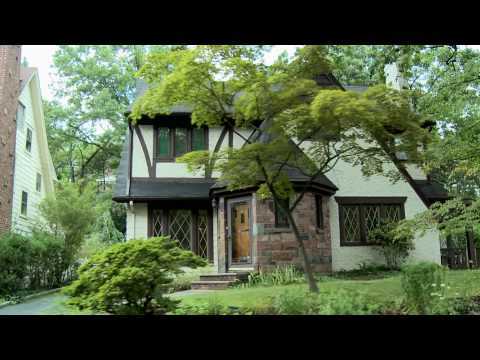 A Colonial Gem in Great Neighborhood. This house has it all and then some! Nicely landscaped and painted a soothing shade of moss green with white trim and black shutters, this house exudes a soothing charm at first sight. Follow the paving stone path to an enclosed portico, and enter a cheery vestibule with a black and white checkered floor and freshly painted bright yellow walls. An open, airy floor plan features an uninterrupted flow of light, warm walnut colored hardwood floors throughout, sumptuous moldings and wood burning fireplace. The center hall offers a view straight ahead into the kitchen, a wood spindled and beautiful carved walnut banistered staircase off to the left and the living room off to the right. This charming living room is graced with thick crown and dentil moldings, a fireplace with a white mantel and brick and tile surround. A doorway on the right gives entrance to a private office space with built-in bookcases, where you can work from home or utilize as a convenient play area. Straight ahead are the family and dining areas with charming built-in bookcases and an overhead bookshelf for decorative display. 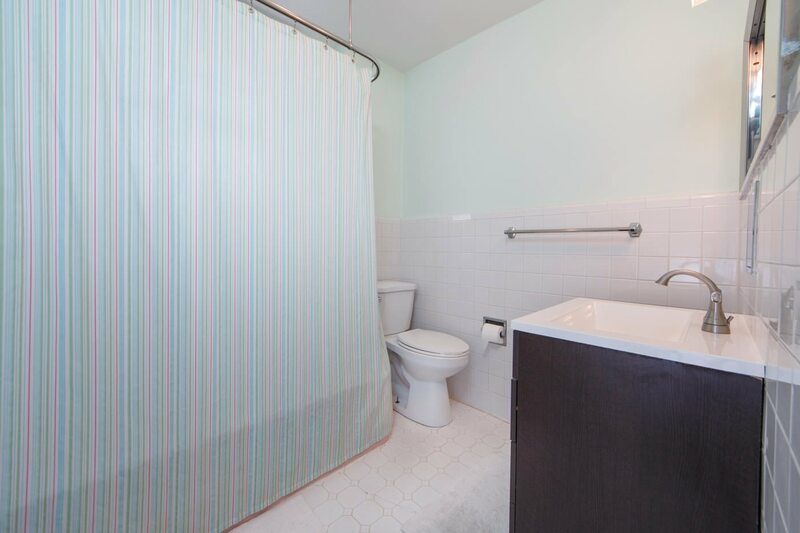 The cheery kitchen has ample cabinet and drawer space, updated stainless steel appliances and a breakfast nook that leads to a newly renovated powder room. A doorway to a covered patio for outdoor dining and relaxing is a bonus rain or shine and opens to a fenced yard with patio area. Inside, climb the staircase with white risers and walnut steps to the second floor landing. 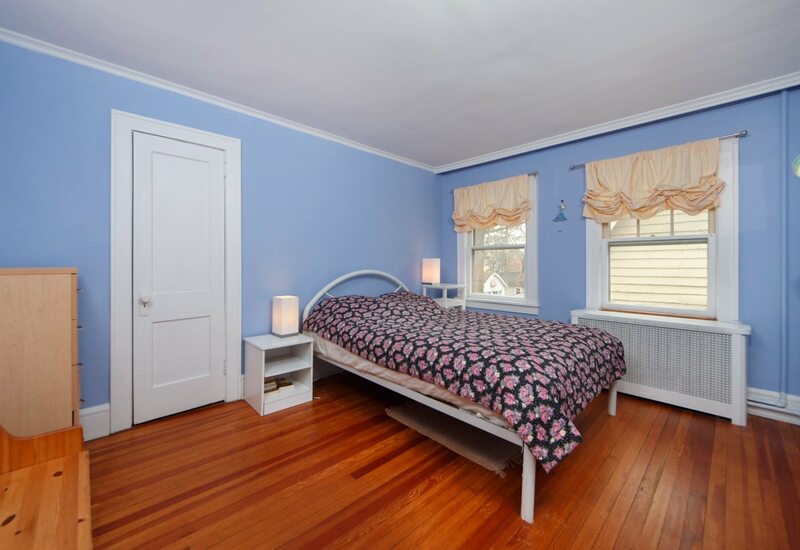 Here you will find three generously proportioned bedrooms with lots of light and closet space. 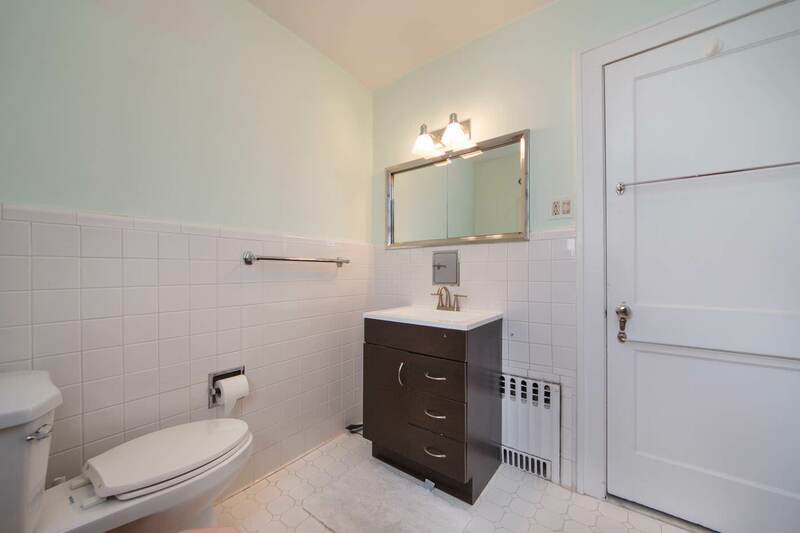 A full bath with a shower over tub serves these rooms. Down the hall is the master bedroom and bath that offers total privacy. 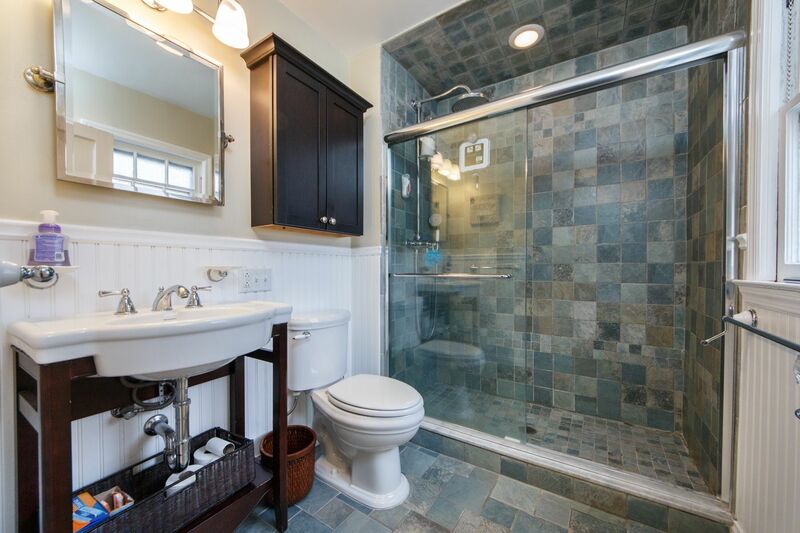 You’ll love beginning your day in this fabulous recently remodeled bathroom with white wainscoting, creamy porcelain modern sink with a bottom storage shelf and gorgeous heated slate tile floors that continue into the gleaming glass enclosed shower stall. A black framed mirror and medicine cabinet add contrast and sophistication. The master bedroom is brightly lit by windows on two sides, is luxuriously proportioned and offers a wall length double closet. And there’s more! Take the stairs up another level and enter the versatile and bright finished attic. High dormer ceiling provides great angles that define this fabulous space outfitted with numerous closets and storage nooks. Let your imagination dictate its function – use this room as your library, guest room, music room, gym or den. Additionally, the partially finished large basement is immaculate and has recessed fluorescent lighting and lots of open space. There is an abundance of closet and storage space and a large laundry area. With its top notch schools and access to world class shopping and restaurants as well public transportation into nearby Manhattan, 36 Madison Street is the perfect place to call home. Living Room with hardwood floors dentil moldings, coat closet in entry foyer, fireplace with white wood mantel and brick surround, windows with venetian blinds, access to kitchen, office, dining and family room, staircase to upper levels. Home Office with crown moldings, hardwood floors, built-in bookcases, two walls of windows covered by wood type venetian blinds. Dining room with hardwood floors, dentil moldings, built-in bookcases, overhead decorative shelf. Open to Family Room. 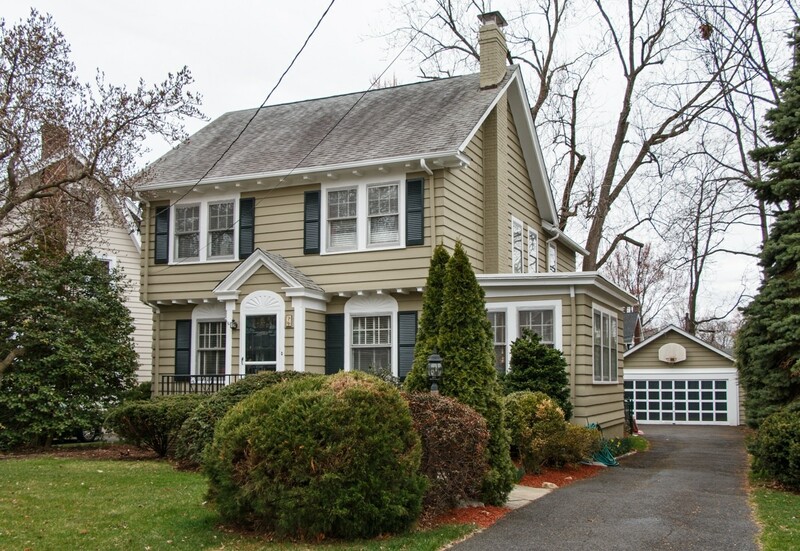 Family Room with crown molding, chair rail, hardwood floors, windows covered by venetian blinds, access to kitchen. Kitchen with vinyl tile floors, natural wood color cabinetry and drawers, “U” shaped white formica counter-tops, double sink, stainless steel dishwasher, Samsung stainless steel refrigerator, breakfast nook with pantry, powder room and access to back door leading to covered patio. 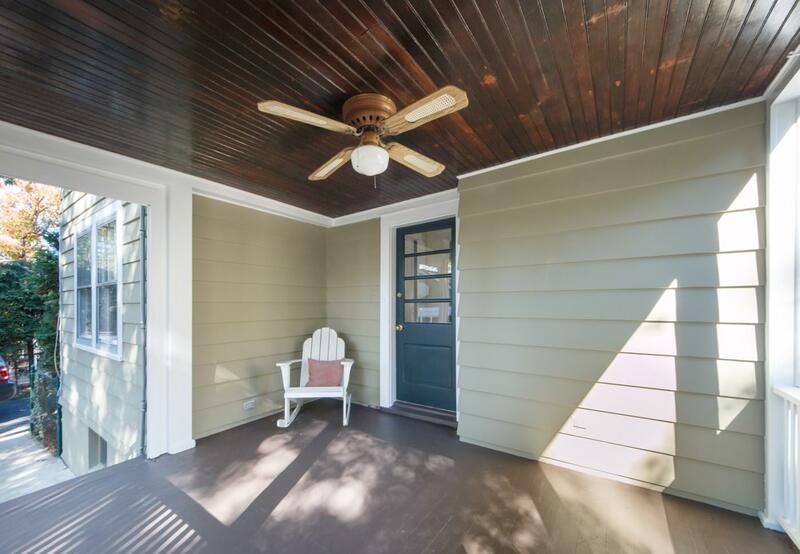 Covered and fenced above ground patio with painted wood floors. 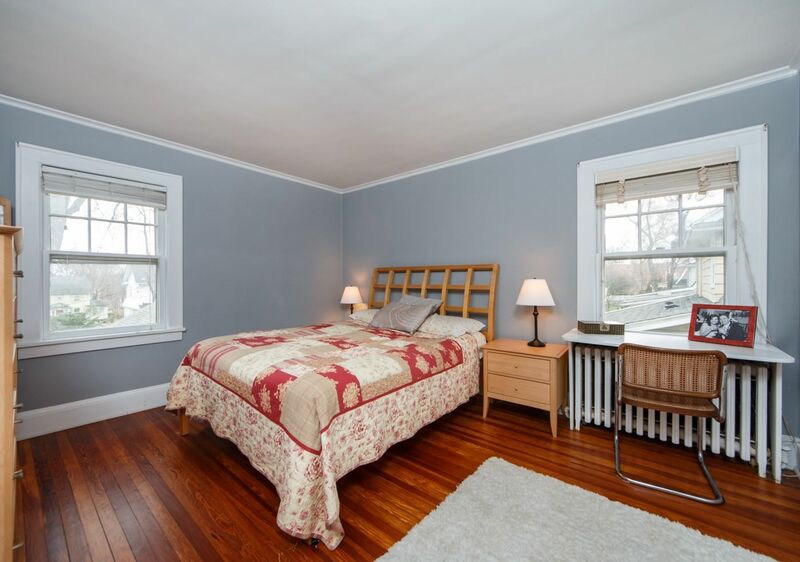 Bedroom #3 with hardwood floors, crown molding, built-in bookshelves surround double windows over radiator box, closet. 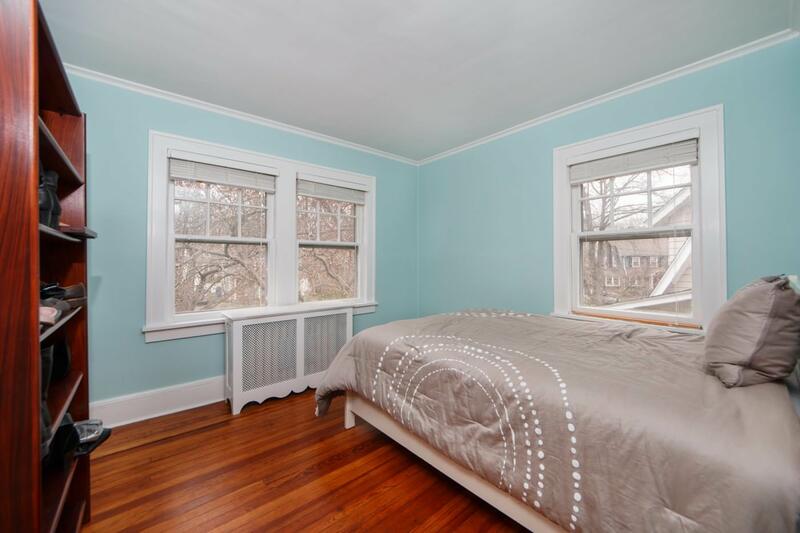 Bedroom #4 with hardwood floors, crown molding, two windows and closet. Master Bath with slate floors and shower wall, glass shower doors, modern sink with storage shelf, wainscoting, black wood framed mirror over sink, black wood medicine cabinets. Master Bedroom with hardwood floors, crown molding, 2 windows covered by venetian blinds, double width closet with full length oval mirror on sliding doors. 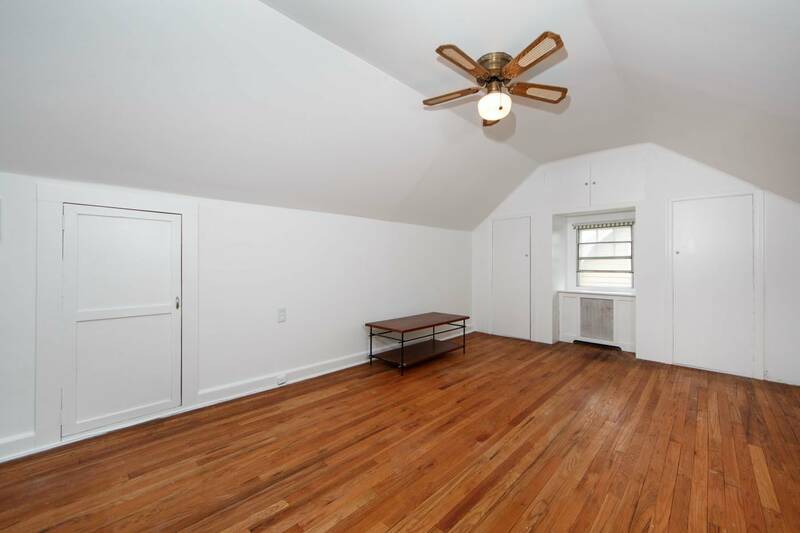 Finished attic space with hardwood floors, ceiling fan with light fixture, dormer ceiling, two closets surrounding niched window and crawl space. 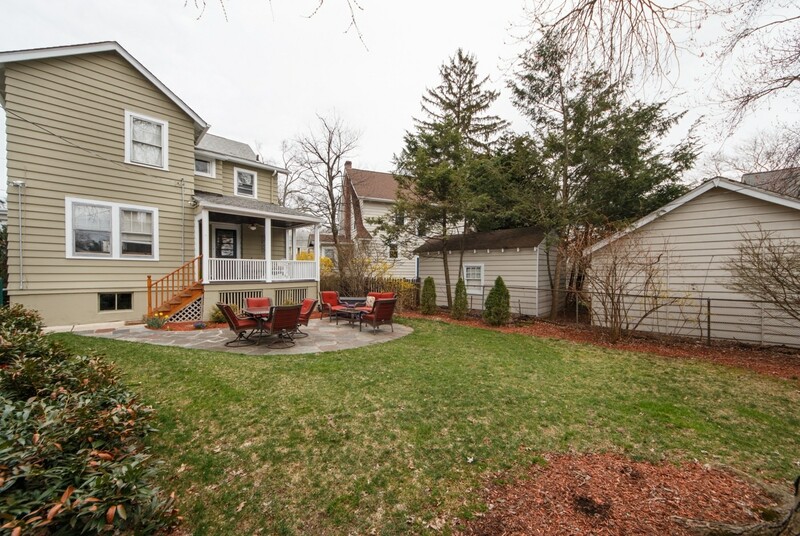 Fenced yard with paver stones defining patio area, 2-car detached garage. The School District of South Orange and Maplewood is served by The Montrose Early Childhood Center, seven elementary schools (Clinton, Jefferson, Marshall, Seth Boyden, South Mountain, Tuscan Elementary, and South Mountain, Annex), The South Orange and Maplewood Middle Schools as well as Columbia High School. All of these institutions have a positive reputation for academic rigor and boast extensive lists of impressive accomplishments that result from the strong emphasis on academic excellence and social responsibility as the foundation for all their educational endeavours. Columbia High School is known as one of the most academically progressive high schools in the state of New Jersey and has been recognized nationally for its academic excellence with a Blue Ribbon award from the US Department of Education.The advanced academic programs, committed staff, full-range student support, and extensive extracurricular programs allow students to become lifelong learners and achieve acceptance into some of the nation’s top universities. The South Orange-Maplewood Adult School stands as a testament to the value that this community places on education, offering continuing education classes in a diverse range of subjects for adults in the community who want to keep expanding their worldviews. For the summer months, the district provides a highly praised children’s camp, the South Orange-Maplewood Community Summer Program. Maplewood residents have convenient access to the Maplewood Train Station which provides direct access to New York Penn Station, Newark, and Hoboken, and The Port Authority on New York and New Jersey is nearby, featuring additional rapid transit options throughout New York. The area also has its own Jitney Bus Service that provides easy public transport to and from the Maplewood Station for the everyday commuter, and multiple bus routes in the area ensure that there are even more transport options to New York and throughout New Jersey. 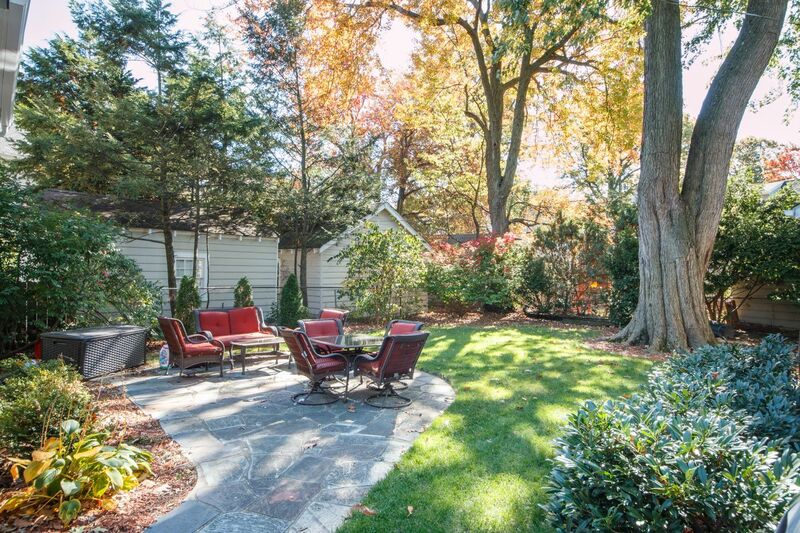 Maplewood is also situated near to routes 24, 280, I-78, 124, The New Jersey Turnpike, and The Garden State Parkway by car to ensure easy travel options throughout the state, and Newark Liberty Airport, a major continental and international gateway, is only a 20 minute drive away.